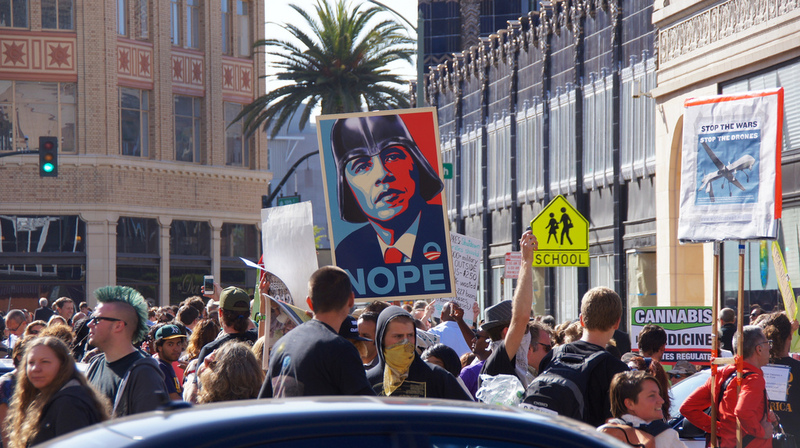 President Obama's stop in Oakland Monday was billed in part as a populist gathering to mobilize the base. He was met on the tarmac at Oakland International Airport by Oakland Mayor Jean Quan, U.S. Rep. Barbara Lee and Alameda County Supervisor Keith Carson, among other local officials, before he headed to the Fox Theater to speak at a fundraiser - you can see a photo of the president at the podium here. But government officials and Democratic supporters weren't the only Bay Area residents who greeted the commander-in-chief. KQED's Aarti Shahani reported that about 100 protesters also gathered outside the Fox on Monday, demonstrating on issues ranging from gun control to the federal government's policies on medical marijuana. 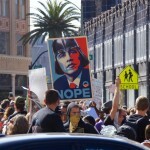 Click here to check out photos of the protests on Flickr. Josh Richman of the Bay Area News Group was the pool reporter for the fundraiser - his coverage was sent to other news outlets for their use. You can find a raw version of his final pool report of the evening here. After the event in Oakland, the president's motorcade drove to San Francisco via the Bay Bridge. Tolls paid by the pres: $0.